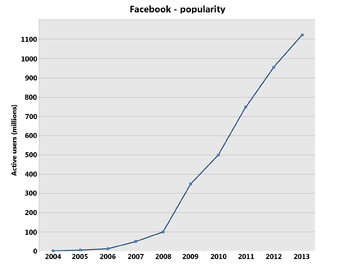 ” Facebook Looks at a Coming Golden Age ” – April 12, 2015. 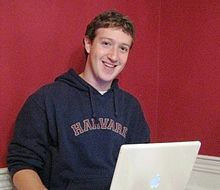 Mark Zuckerberg, Co creator of FB in Harvard Dorm Room in 2005. Facebook ( FB ) is in every discerning mind’s age displaying special powers of omnipresence and omnipotency in today’s world of growing ‘Social Climbers’ with a common purpose. 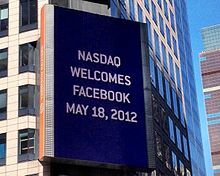 Billboard on Thomson Reuters building welcoming FB to NASDAQ 2012. A predominantly Social Network Medium promoted with the chief objective of ” Connecting the World ” captivating instantly and totally the attention of the young and the old alike opening their minds to smooth networking and collaboration. Inside the FB Headquarters, Menlo Park, CA, in 2014. Headquartered at Menlo Park, California, U.S.A., its 1. 39 billion users; 30 million small business accounts; and 2 million advertisers speak for its ubiquitous march in our society in this millennium. Within a decade of its launch it has almost become a solemn badge for anyone wishing to get accepted in the society. Now in its phase of expansion, three significant offerings make Facebook ” increase its breadth ” while simultaneously posing challenges to standalone competitors in their respective sectors : (a) FB Banking; (b) FB Enterprise Network; and (c) FB as a participating agent in Internet of Things ( IoT ). 1. FB Banking : The intent of this service is to enable money storage; exchange money with others; utilising money to buy goods and services; send presents to the near and dear; … .. . The huge following that FB enjoys is its Capital. Consider the situation where just 1/4th of the users engage genuinely in such transactions and the nerves of the big banks, or even PayPal/eBay may well get frequent twitches. For FB which prevails over social networking, this will be like opening its brand of ” relationship banking “, a thing almost unseen in today’s competitive circumstances in traditional banks. An initiative that will send a wake up call to many in the sector. 2. FB at Work : This signals the climb to the next rung of the ladder of growth, a welcome addition from the consumer oriented networking tool to an enterprise oriented communication tool. Salesforce.com’s Chatter and Microsoft’s Chatter will likely get aroused. Designed for employees’ mutual action and collaboration but requiring far more involved and penetrating capabilities than what is existent in the consumer oriented social networking. Challenges are not just limited to this alone. Categorization of individual and work accounts and other complexities as and when the use begins will need to be tackled. The big plus point, though, is the ‘familiarity’ that one has with FB. An initiative that marks a fresh enterprise play from a wholly consumer play. 3. FB’s foray in to Internet of Things ( IoT ) : Cisco predicted that by 2016 about 26 billion devices will be connected to the Internet. Companies and big players are gearing up to be counted as agents in this big game. FB’s clout cannot be contained as its acquisition of Parse, a cloud application platform, would suggest. Parse is a pastmaster in the development of software in guiding the IoT play. For its part, FB also encourages the developers to work on specific events to connect them to the whole system. An initiative that makes it a part of a systematic world in the IoT play. The above mentioned initiatives are an essential part of ” New Service Offerings ” that companies resort to usually in the growth/diversification phase(s). These are not new to customers but constitute new uses for existing customers as well as new registrants. In effect, it is a sort of ‘service duplication’ much akin to, if one were to draw a parallel in industrial settings, for e.g., Kodak’s introduction of Instant Cameras challenging the Polaroid in the late 1970s. Hence, these cannot be counted as innovations and to what extent these will alter the customer behavior and customer interest patterns is not clear at this juncture. The focus, however, in these introductions is on both the existing users and addition of new registrants who will be convinced of the usefulness of the platform. Opportunities for these services exist; target segments are covered in the 1. 39 billion and more users; the services mix for these offerings are determined by the interests of the users – all within the context of FB’s grand ” Strategic Plan “. With ‘FB generation’ growing by each day and FB’s brand name and presence in the sphere of social engagement remaining strong, can FB become the ” Real Choice ” of people for their services in future is what will cross the minds of stakeholders, analysts, users, and people at large. In pirlicue, to quote what CEO, Mark Zuckerberg said in 2012 : ” We don’t build services to make money; we make money to build better services “. Tidbit : Facebook ( FB ); Market Cap : $ 229. 63 billion; Stock price : $ 82. 04 ( 10/4/2015 closing ); P/E Ratio : 73. 25; EPS : $ 1. 12; Shares outstanding : 2. 24 billion.